Book Review | Make Time For Sports. “In the morning of 3rd February, 2007, I was lying naked on a cold metal table. My entire body was being shaved, except the head. I was joking with the hospital attendant that this was a contrast to the tonsure at Tirupati, where the head was shaved and the body hair left untouched! Thus begins the preface of P. Venkatraman’s book, “From Sofa to 5K: A Beginner’s Handbook on Running for Good Health” with a foreword by renowned cardiologist Dr. Aashish Contractor who is also an avid long distance cyclist and runner. Venkatraman outlines his story in the prologue describing his family history of heart disease beginning with his grandfather. His father and younger brother too were similarly affected. Venkat details how he was always health and diet-conscious throughout his early life. The author began running in 2004 and by the very next year was completing half-marathons. All this physical activity, however, could not prevent a 100% blockage of his left artery. And in Feb 2007, Venkatraman underwent heart surgery. In January 2008, he ran the Mumbai half-marathon once more highlighting the second coming of the inspirational founder of You Too Can Run. You Too Can Run’s mission is ‘To Promote Running For Good Health’. Venkatraman divested his stake in one of India’s largest BPOs where he was a Promoter Director and founded his social enterprise. The book is an attempt to inspire others to take up running for their health and is published by You Too Can Run Sports Management Private Limited who have registered themselves as a publisher with the HRD Ministry. Chapter 5 onwards tackles the actual subject of running for beginners. IITian and running coach Daniel Vaz is the technical editor of the book while nutritionist Kinita Kadakia is a major contributor to sections dealing with weight loss. Venkatraman initially lists the psychological, social and physiological reasons for running. There follows an entire chapter devoted to getting started—the most interesting part is how to handle aggressive stray dogs. Chapter 7 deals with progressive loading and has a beginner’s 5K running plan pull-out. Most beginners are astounded that they don’t start losing pounds immediately or sometimes for quite a while despite being quite regular and disciplined with their exercise programme. Kadakia answers these questions in the chapter ‘Running and Weight Loss‘ and how losing weight is simply about burning more calories than you consume i.e. a calorie deficit has to be created and maintained. Finally, ‘Staying Motivated‘ is simply about that—how to keep oneself going and how it all begins with setting a goal. The book also provides a Daily Health Log sheet that helps runners cultivate a habit of checking their progress towards their goals. The book is of value specifically to someone who wishes to start a running regimen. Recommended for beginners—you could do worse. In one of my posts on the Lodha Commission recommendations to the BCCI, a reference was made to Go Sports Foundation’s handbook for young Indian athletes and how a similar publication could be off immense help to aspiring cricketers. Go Sports Foundation is a non-profit trust established in September 2008. Their mission is to empower India’s future Olympians. Their board of advisors consists of Abhinav Bindra, Rahul Dravid and Pullela Gopichand. Athlete Development Programmes that include Rahul Dravid Athlete Mentorship Programme,Badminton Development Programme, Para-Champions Programme, Abhinav Bindra Shooting Development Programme and Athletes’ Education Programme. Ecosystem Projects such as Athletes’ Conclave and Beyond the Finish Line. The Athletes Handbook 2013: FAQs for the Young Indian Athlete is co-authored by some of the top names connected to Indian sport. Bhishmaraj Purushottam Bam, a sports psychologist, a former Inspector General of police and qualified coach in pistol and rifle shooting answers questions pertaining to Mental Conditioning. Sharda Ugra, a sportswriter and currently with ESPN Cricinfo, advises the young athlete how to interact with the media. Deckline Leitao, a Sports Performance Specialist, replies to question on Fitness Training. Dr. Korulamani Santosh Jacob, an orthopaedic surgeon specialising in arthroscopy and sports medicine and once team doctor to the Indian men’s hockey side, is all about Sports Medicine. the National Law School of India talks about legal and commercial issues. He’s also a former junior cricketer and Managing Trustee of the Go Sports Foundation. Finally, Ryan Fernando, a certified Performance Nutrition Expert, dwells on Sports Nutrition in the final section. “How do I avoid answering a question that I am not comfortable answering? “A healthy athlete should be able to recover completely from donating blood in eight weeks, but he/she may lose some of the ability to train for the first few days. What is the meaning of sports? Why do they mean so much to us? Why do you and I invest so much time, money and emotional energy in following them? Mandelbaum’s publication is divided into four chapters, three of which devote themselves to each of the team sports that dominate the American hemisphere. The first chapter deals exclusively with the questions outlined at the beginning of this article. I have attempted to present a synopsis of this segment of this work. According to Mandelbaum, baseball, basketball and football are modern creations. Team sports have become popular as childhoods have grown lengthier in the modern age. Children no longer help out in farms and at work and thus have more leisure time than earlier. Childhood is now the most enjoyable phase of an individual’s life and it is nostalgia for a pleasant, carefree time of life that sustains interest in games into adult lives. Schools have taken over from hearth and home when it comes to teaching skills that need to be used in the workforce. It is also the institution where organized games are first encountered. The growth of American cities are crucial in the rise of team sports. The transport revolution made these sports a national phenomenon. This also led to a series of similar formats and uniform standards given expectations of similar quality. Mandelbaum compares sports to organized religion. They address needs of the spirit and psyche rather than those of the flesh. They don’t bear directly on basic needs namely food and shelter. They are outside the working world. They are a welcome diversion from the routines of daily life, models of coherence and clarity and have heroic examples to admire and emulate. Sport is a way of ‘disporting’ i.e. diverting oneself. Human being need to be diverted from the wears and cares of modern life. We seek diversion in staged drama. Drama is simply tension and its release, that is, uncertainty ultimately relieved by a definite conclusion. Sports provide audiences compelling drama. Outcomes are unknown—for both individual games and the season. Team sports are epics. Their protagonists overcome a series of challenges to meet their ultimate goals. Coherence is another basic human need. All cultures seek order and intelligibility. Team sports is a low or “mass” form of art accessible to the majority of society. They are supremely coherent. They provide a haven from the vagaries of modern life. Games are models of coherence. They are transparent and they are definitive. Team sports have evolved much like Hollywood. At first, the major production companies were all-powerful. They decided which movies were to be made and who would feature in them. Now, it is the actors who are arbitrators. They rule tinsel town and command astronomical fees. Similarly, team owners were omnipotent—at first. But now, players rule the roost and decide which sides they turn out for. Labor in movies and sports cannot be readily replaced. The best performers enjoy enormous leverage. The public pays to watch them. Sports stars, unlike movie stars, are real and spontaneous. Sports supplies heroes. Heroes are objects of admiration and emulation. They can be exceptions or exemplars. The latter embody virtues that everyone can aspire to and everybody can practice. Extraordinary mortals yet role models. They display diligence and performance under pressure. These are qualities much suited to the modern world. Who wouldn’t want to be described as diligent and yet graceful under fire? Sports stars, however, possess a narrow range of skills. They are specialists—outstanding ones. America is a democratic country. Costumes (uniforms) worn by participants reflect its social egalitarianism. They express equality. Team sports also express the principle of merit. No side begins with an advantage. The score is always 0-0 at the start. Preference is for achieved status. Team sports is a division of labour. It has two main parts: Specialization and Interdependence. No player can win a game singlehandedly. Each team needs to cooperate within themselves. Each game and each series also embody the opposite principle: Competition. This is a parallel to modern life. Everyone who works in an office or factory is a part of a team. These teams compete with other teams to survive and prosper in the marketplace. Rules are overridingly important in sports. Universality: they apply equally to all players and citizens. Transparency: they are known to all. Legitimacy: they are accepted as binding. Referees and umpires are the equivalent of judges. Clarity and simplicity of rules in these three sports distinguish them from individual sports such as diving, gymnastics, figure skating or even boxing. There is very little discretion applied by officials. Questioning and protesting an official’s decision is actively discouraged. Players can be removed from games if they are felt to have transgressed a certain boundary. The most serious attack on the integrity of the game is not when an individual or a team tries too hard to win but when a player or group of players deliberately set out to lose. When a contest is ‘fixed’, its outcome pre-decided, it is no longer a game. Cheating is thus the ultimate sin. This is the reason why doping in athletes is met with virulent condemnation. Equality of opportunity and merit are deeply ingrained in North Americans. The US is more deeply committed to ensuring the wherewithal needed to take advantage of opportunities. The amateur draft and salary cap are the mechanisms used in professional leagues to restrict the role of the free market and make teams more evenly matched on the field. European societies, on the other hand, are more committed to equality of results i.e., draws or ties are more common in games like soccer, cricket and rugby. Overseas, identification with teams has a polarising effect. You support one side and rail against the other. Team sports reflect and aggravate social and political divisions. Not so, in the States. They are both sources of integration and division. American team sports do not have international competitions. They are self-contained. These games are barely played elsewhere. There is very rarely violence visited on team competitions. If fights break out, they occur over high school games. Geographic mobility is a part of an American’s life. He or she will move for college education and jobs—several times in their lives. High school teams may have co-located players. But colleges and professional sides draw upon persons from all over, even overseas. Professional sports are also melting pots for various ethnic groups, much like the larger cities. Sports is thus a microcosm of cosmopolitan America. The above are similes and metaphors for why sports is so important to sports lovers and what it actually means to all of us. Some metaphors could apply to other societies as well. It would be interesting to compare the reasons why sports in gaining traction in India as an industry to its evolution in the States. The proliferation of leagues in multiple sports as vehicles to promote them and provide means of livelihood to many is a recent phenomenon. Are there more parallels than differences? Some metaphors may resonate with you more than others. Some of them might make you think. Aloud. I know it certainly struck a chord with me and opened my eyes as to how and why sports can be a way of uniting rather than dividing. Sports recognizes no class barriers—in theory. I hope you enjoy reading this piece as much as I did Mandelbaum’s chapter. If you don’t, blame me and not Mandelbaum! 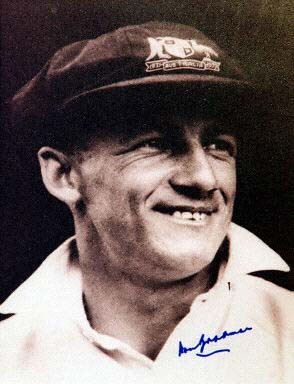 Donald George Bradman made his Test debut for Australia at 20 against the 1928-29 visiting England side. Although Bradman aggregated 468 and played in four of the five matches in the series, there was very little inkling of what was to follow in the summer of 1930 when Australia toured England. The Summer of 1930 is recalled as “The Summer That Changed Cricket”. Christopher Hilton in his book “Bradman and The Summer That Changed Cricket: The Amazing 1930 Australian Tour of England” documents Sir Donald’s innings and the reactions to his stupendous Test aggregate of 974 in five Tests; a monumental feat that has not been surpassed in eight decades since. Corporate governance has been in the Indian news headlines quite recently in connection with the scam perpetrated by Raju on Satyam shareholders and employees. Interestingly, Satyam was the recipient of numerous corporate governance awards. Just goes to prove that just because processes are in place, does not imply that the processes are being followed. The spirit of the law is more important than the letter of the law. But then India is a nation that loves it’s forms, it’s idiosyncratic processes and customs,it’s bureaucratic ways and any change is greeted with derision, disdain and shock. Processes are meant to be traditionalized, embedded into the culture of the company and not uprooted without a by your leave! Who minds it’s clutter? For more laid-back news followers, Satyam was just another scandal in just another family-run business.Satyam despite all its protestations , was just that – a family-run business though it’s shares were listed on the Indian stock exchange and available via ADRs.The more engrossing and entertaining corporate scandal has been the IPL imbroglio and it’s many running installments in the Indian media rumor mill. Now, the IPL has a governing council which is equivalent to a corporate board of directors. In theory, a board of directors is an independent body that oversees the management of the corporate body or entity. It is there to make sure that the right processes are adhered to, that due diligence is carried out while executing strategy and no hanky-panky or unethical acts are carried out by any of the top management honchos. But in practice, this is easier said than done. Most corporate boards are appointed with inputs from the incumbent management and thus cronyism is the name of the game. The typical board is populated with members who thus tend to be hand-in-glove with top management. This seems to have been the case with the IPL governing council. Despite the presence of luminaries such as Ravi Shastri, Sunil Gavaskar and M A K Pataudi on the governing council, the BCCI finds itself facing a scandal of gargantuan proportions with conflict of interest and high-handedness tarnishing the fabric of IPL governance.